I told you I was working on a makeover. Well, it's almost complete. In the last few days I have prepared for this serious overhaul. Then, last night, I started making the change. Thanks to Cinnamon Girl Studio I didn't do half as much work as last time I updated the blog. Over the last 4 years I've changed, and grown and moved things several times. 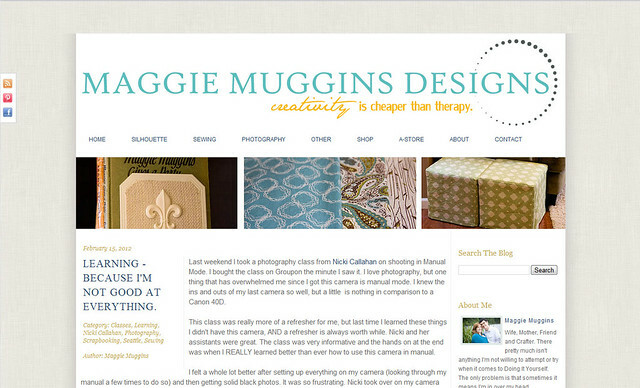 This latest move is to maggiemugginsdesign.com. I now have my own website! Yes, it's still mainly just the blog. But after closing my etsy shop last year I decided I wanted to bring things together to one site. Eventually, my shop will be here as well. When I'm ready to open up shop again. There are still a few kinks to work out, some things showing up in weird spots, some links in my menu aren't set up yet, and a few more pages for me to work on. Those things will come as I find time though. I love the new look and I hope everyone else does too. I wanted something a little more classy and I think I achieved that. My new logo I designed myself. It was so much fun to see it all come together. 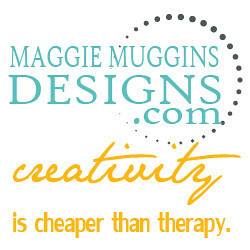 My tag line "creativity is cheaper than therapy" has been a motto of mine for several years. I started crafting more when I was having a difficult time after the birth of my first son and it helped me work through things without going to a therapist. I really truly believe in creative therapy - starting and finishing something is SO rewarding. The main reason I blog and share my ideas with everyone is to inspire others to create as well. Pop on over if you're viewing this in a reader and check out the new look for yourself! Maggie, this looks super awesome! Nice job on the logo :) Everything is coming together great. "Creativity is cheaper than therapy"... love it. True words. Great job!